Query Letter Advice: Never Say This in Your Pitch! Never Say This in Your Pitch! Here's some query letter advice to write the perfect query and eliminate common mistakes. Without a first-rate query, also known as a “pitch”, you’re never going to sell your articles. And if you can’t sell your stories, you don’t get to write them! Your query letter is the most important piece of the freelance writing puzzle. It gives you the opportunity to sell a magazine editor on your story idea. Producing a good query letter is difficult enough. And you can sabotage your pitch with ill-chosen statements and other inappropriate matters. Are you sending plenty of queries out the door and receiving no responses or too many rejections? Now might be a good time to re-examine your query letters for these blunders. Are you making any of these mistakes? 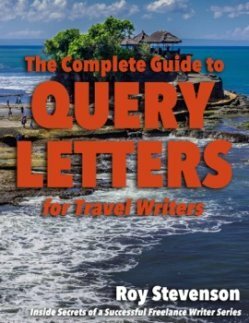 Here are a few of the many creative ways that novice travel writers have found to damage their own query letters. I sorted them into nine categories and included my best query letter advice to counter these self-destructive sentences. Note: These examples of query letter gaffes are real (! ), as reported by magazine editors. Novice writers damage their queries with self-sabotaging sentences like, “I have no experience but . . .” or, “This is my first story idea”. These sentences won’t instill confidence in editors! Displaying a lack of confidence in your story ideas or writing abilities will result in the editor hitting “delete”. Editors aren’t going to waste their time with writers who appear to doubt their own abilities. The competent and self-confident writers will get the job. You want to convince the editor to hire you, and not shy away from you. The key here is to project confidence in your writing abilities without appearing arrogant. When you don't have bylines, explain convincingly in your query why you're the best person to write this article. If you’re an expert on the topic you’re pitching, this will usually compensate for your shortage of bylines. Telling an editor, “You’ll regret not assigning this” is a surefire way to make the editor do the complete opposite and ignore your query. Editors like to be led gently along by your query, to a place where it’s almost impossible for them to decline your story. They don’t appreciate being bullied or cajoled. Nor do they like writers that project arrogance. The perception in contemporary freelance writing circles is that arrogant writers will be high maintenance writers. “All your readers will love this”. Tell the editor why the magazine’s readers will be interested in your story. Avoid absolute blanket statements like the above. Pitch solid, well-researched query letters. And present your story idea clearly and concisely. Let your query speak for your abilities. Another turn-off for editors is lame statements that indicate you’re pitching for the heavyweight division, rather than the bantamweight division where you really belong. In other words, you’re in over your head—and it shows! Editors expect a certain amount of experience from their writers before they cut those checks, so if your query letter reeks of inexperience, don’t expect a reply. "My mother loves this idea." 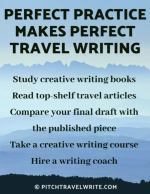 There’s no substitute for experience and, with few exceptions, most travel writers work their way up by starting with the more modest publications. The good news is that most online, local, and regional magazine editors will work with beginners if your story angle is enticing enough. So, when you’re starting out, go where you’re more likely to have your work accepted - online and in the local and regional print market. If your story angle is solid, exciting, and you’ve presented your case professionally, there’s no reason why an editor should not go for it. It shouldn’t matter whether you have bylines, or not. An immediate query letter killer is when you present ridiculous statements that indicate you’re a complete novice. Phrases like “I only accept $2 a word—but this is negotiable”, or, “5,000 words are my preference for this article” will be great sources of amusement and head-shaking for the editor—just before he or she hits “delete”. The Writers Guidelines tell you what the magazine pays for articles, and the number of words they’ll accept. The writer doesn’t determine this. And mentioning payment in your pitch is premature. You need to sell your story idea first. After the editor indicates interest then you can discuss payment. Even the faintest hint of laziness in your query will kill your pitch. Stating that, “I hardly ever miss deadlines” instills an element of doubt in the editor’s mind. It sounds weak and indicates laziness. Sentences with poor grammar and spelling like, “I can writ real good” are not going to earn you any points with the editor either. These simple errors show that you’re too lethargic to check your basic writing. Stubbornness (“I don’t do edits. Period.”) will also kill any chance you had of getting your story into print. Ensure that your spelling, punctuation, tense, grammar, and style are perfect before you submit your query. This indicates you’re detail oriented—a quality that warms the heart of every editor! Show a willingness to work with the editor on your story angle, rewrites, and anything else they require, and you’ll earn big bonus points! The editor is likely to go with pitches from writers that he or she feels are certain to get the job done well, without much editing, follow-up, or rewriting. Any indication that you haven’t done the homework for your proposed story idea (“I haven’t lined up my sources yet”) is bad form. Editors expect queries to deliver certain standard pieces of information that come from basic research. For example, you should indicate that you’ve read the magazine’s “Writer’s Guidelines”, also known as “Submissions Guidelines”. Your query letter should clearly show you have a mastery of your topic and done your research. Include details of the interview sources you have lined up, and reassure the editor that you always meet deadlines. Pleading for assignments is another no-no with query letters. If you can’t get a freelance writing assignment on your own merits, you’re definitely in the wrong business! "I really need this assignment." Editors simply want to hire writers that can deliver a quality story. Keep your struggles private. Don’t beg! Overfamiliarity with the editor is a turn-off. Likewise, there are certain things that are never discussed in the initial query letter. As mentioned before, never broach the subject of money. Don’t mention what and when you expect to be paid for the piece. “Dude u will luv this”. “I’m giving you first dibs”. Stick to standard business letter tone and format. A query letter is a business letter. Discuss payment in a later email when the editor shows interest in buying your story. Shooting yourself in the foot with tactless or inane statements is a surefire way to quickly lose an editor’s interest. There’s enough madness in the world without editors letting it in their front door. Have someone proofread your query before you send it out. (Preferably not your best friend! He’s just going to tell you it’s marvelous.) Consult with someone who will be objective about your work. 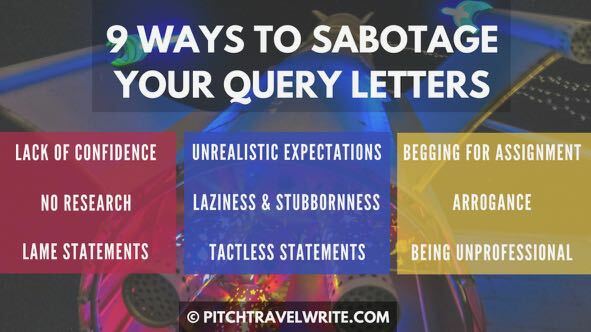 There's no need to struggle with writing a query letter. Here's a guide that tells you everything you need to know, along with 20 sample query letters that you can use as a template to help you write your own queries. It's a steal at less than $20. Roy Stevenson is a professional travel writer and the author of www.PitchTravelWrite.com. 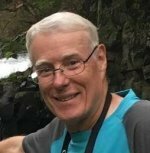 Over the past ten years, he’s had more than 1000 articles published in 200 magazines, trade and specialty journals, in-flights, on-boards, blogs and websites and has traveled on assignment around the U.S. and to dozens of international destinations. IF YOU ENJOYED THIS POST, GET UPDATES. IT'S FREE. Travel shows aren’t just for tourists - they’re for travel writers, too. Here’s how to network with exhibitors and land press trips and fam tours. 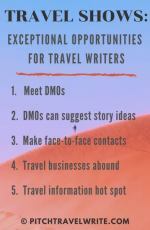 © Copyright 2012-2019 PitchTravelWrite.com. All rights reserved.